My father was born in 1925, the first son of George Stewart, a stonemason and builder from Blantyre (and subsequently Bothwell in Lanarkshire), and Eileen Atkinson from Northern Ireland. He was the fourth in line to be named George, and the only one in the family that I know of to be given the name Prince. 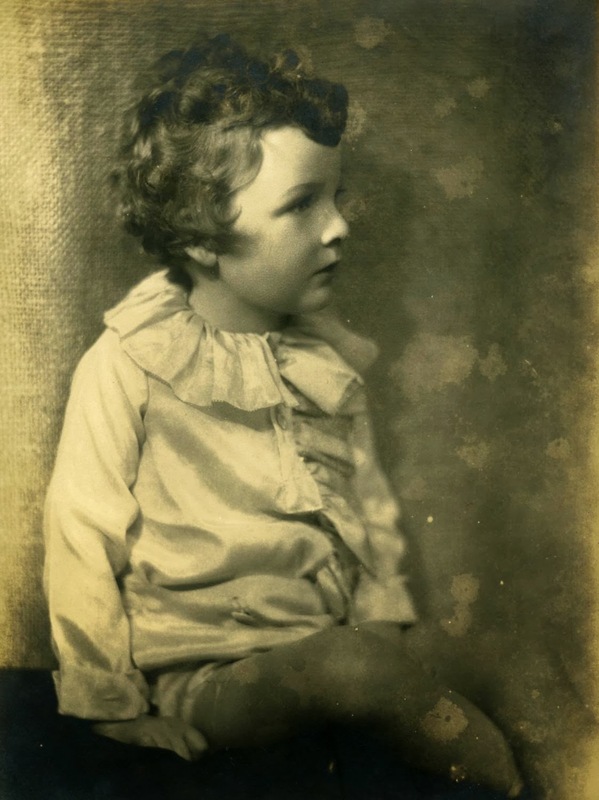 I suspect that this was a fanciful name that my grandmother gave him as her firstborn – and an appropriate name too, when one sees the young George in the earliest photographs of him. 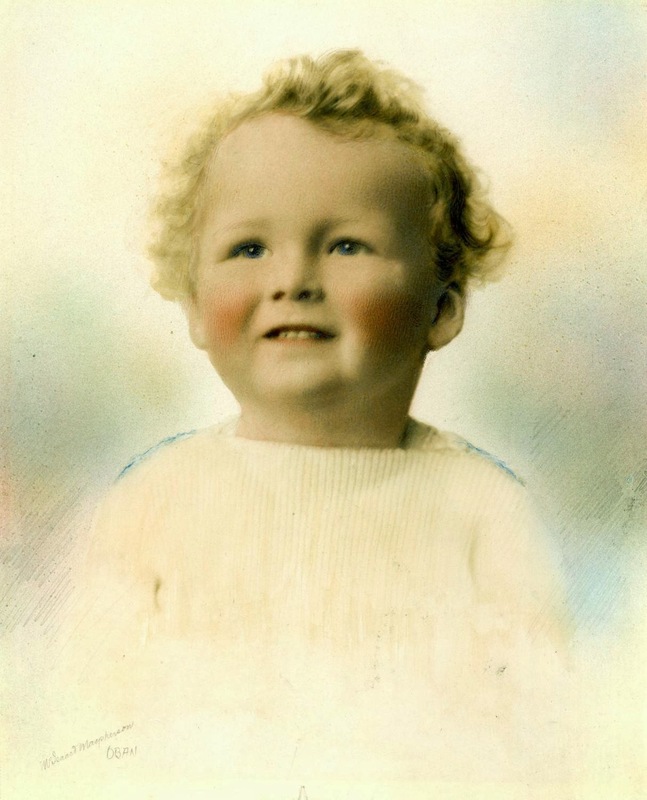 My grandmother thought the world of him – not only naming him ‘Prince’, but extracting the promise from my grandfather that, although he would be christened with the ‘family name’ of George (a name she disliked), she should be allowed to call him a name of her choosing. She chose the name ‘Tony’, and Dad was known by that name to most friends and aquaintances all his life. 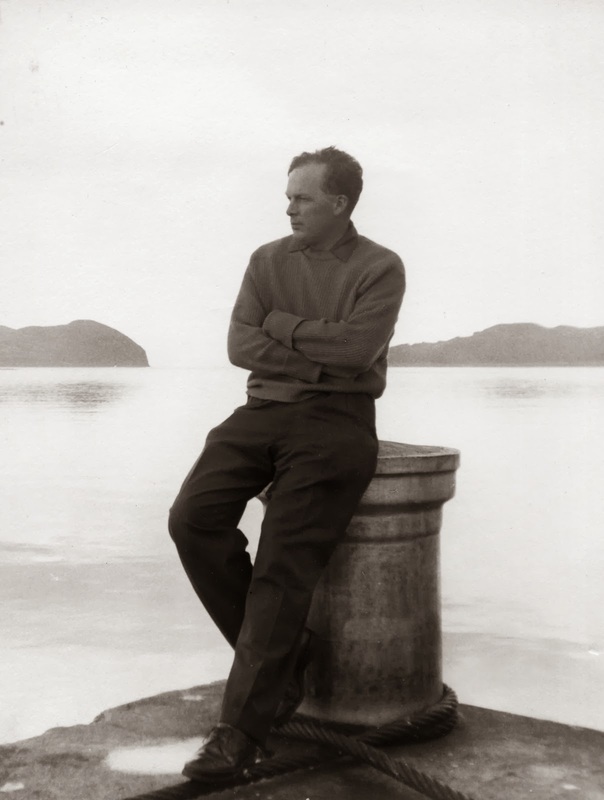 His other middle name, McKean, reveals something of our family history – it was passed down in the family that we were descended from the Stewarts of Appin, in Lorn, – and McKean is a rendering of MacIain. The designation of the chief of the clan is ‘MacIain Stiubhairt na h-Appunn’, or merely ‘MacIain’. Dad recalled his grandmother talking proudly of the connection, although she herself was a Campbell. The family were most likely among the many from the Highlands who flooded to the great metropolis of Glasgow to find work sometime after 1745. When exactly is not known, although Dad tried for a number of years unsuccessfully to find out. His grandfather became well-known and respected for his building works, which included the City Chambers in Dundee, and the Aluminium Works in Kinlochleven. After Craigflower Preparatory School in Fife, Dad was sent to Glenalmond in Perthshire for his schooling. Not an entirely happy experience for him, as he missed being with the family, but he would speak well of the school and was proud of being an ‘OG’. 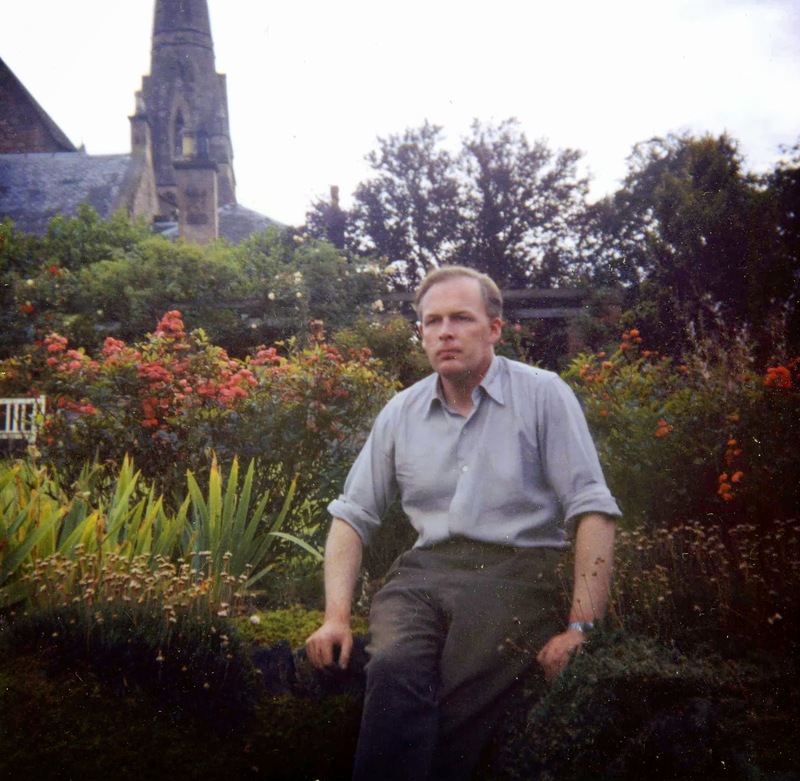 It was while at Glenalmond that my grandfather died of a brain tumour, and Dad’s time there was cut short – it was deemed that the elder son should be at home to look after the family, although Dad’s younger brother, Alan was allowed to continue at Coll. This was naturally enough a difficult time for the family, and having just lost their father, my grandmother followed soon after – finding the stress of living without her beloved husband too much for her sensitive nature – leaving Dad, my uncle Alan and my Aunt Maureen in the charge of their aunt – Arabella (known as ‘Tib’). 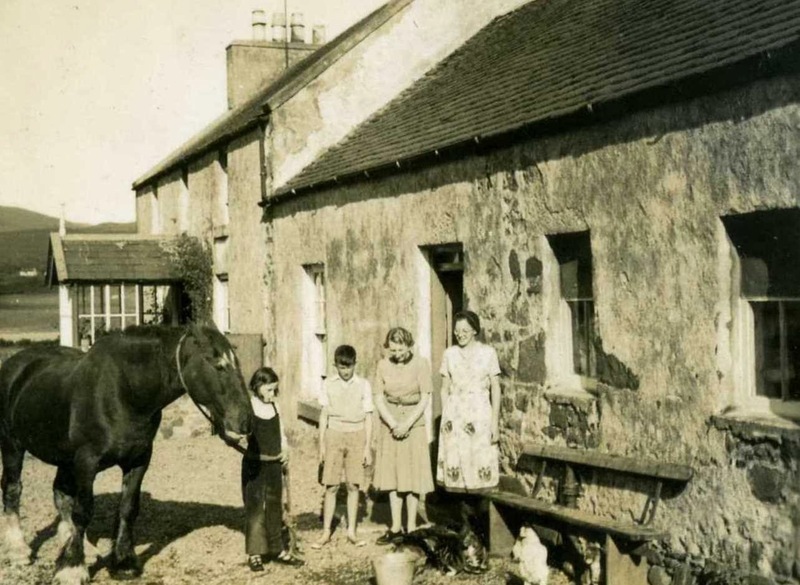 Tib had married Robert Dunlop from Campbeltown, and through this connection many family holidays from the 1930’s on were taken in Kintyre. Gartvaigh Farm at Southend was a favourite, and some of Dad’s earliest attempts at photography were of the farm and nearby Carskiey. They were obviously very happy times and, I believe, played a major part in our own family holidays being Kintyre-focussed, and of the eventual purchase of Dalbuie in 1971. World War II saw Dad doing war service in the Fleet Air Arm, initially stationed near Brighton, where in his free time, Dad went to Art Classes at the College of Art. 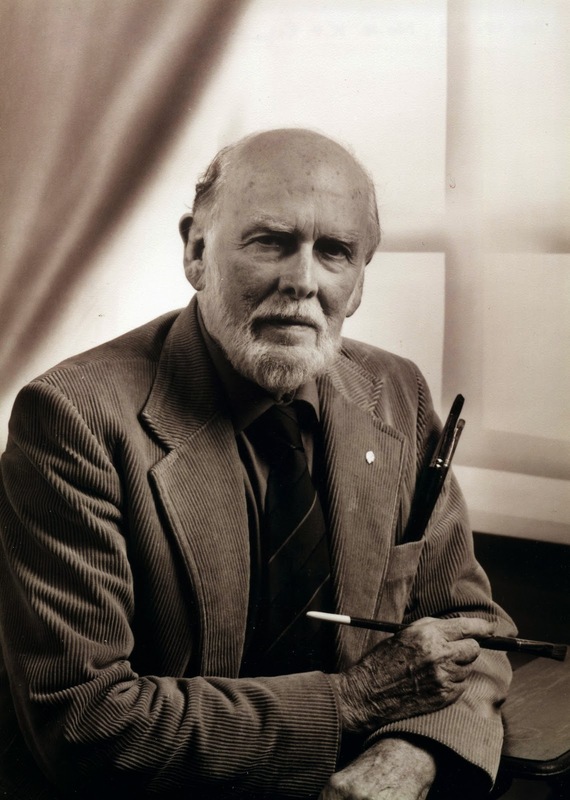 His tutor there was the famed Scottish Artist James McIntosh Patrick, then at the start of his illustrious career. Dad never lost his love and appreciation of McIntosh Patrick’s work – in a style which deeply influenced his own. Even from his earliest days, Dad had had a leaning towards drawing and painting, producing at the age of 12 or thereabouts, a wonderful little ‘nature diary’, filled with notes and detail on birds, animals plants and trees. Indeed, his love of natural things led to an interest in gardening. Dad created several gardens over his lifetime, and I would say that he was not just a gardener, more a ‘plantsman’, very knowledgable on the conditions, soil, etc. that each plant preferred. And if you wanted to kow what a particular flower was, he could often tell you the Latin name as well as the popular one. A couple of his created gardens were extensive and could have stood up against any of the popular ‘visitor’ gardens. His childhood notebook also contained many other things – notes on architecture etc. It revealed an enquiring mind and set the pattern for Dad’s interests for the rest of his life. 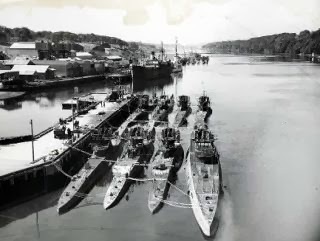 As a young officer, and stationed at Londonderry, he was present when 25 U-boats sailed in to surrender at the port at Lisahally, then the largest of the four bases covering the North-west Approaches. 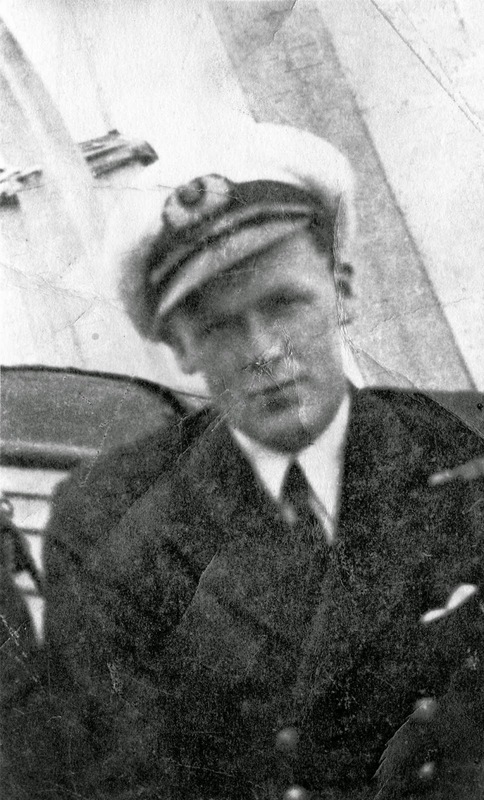 After the war Dad studied economics and statistics at Glasgow University, and after graduating with an MA degree, joined the Burns Laird line as purser on the M.V. Laird’s Isle plying between Glasgow and Belfast. It was here that he met my mother Jackie, who was Ship’s Nurse. They married in 1952, by which time Dad had found employment at Alexander Dunn Ltd, a firm of Fireplace Manufacturers and Heating Engineers based in Uddingston, near Glasgow. The Company was owned by the father of one of Dad’s close friends, who knew of his drawing abilities, and so Dad started as a draughtsman, and was part of the drive to create their unique under-floor warm air central heating system, eventually rising to the position of Managing Director when Alex Dunn (Jnr) sold the company and emigrated to Melbourne, Australia. After this Dad ran the company through many turbulent years and several changes of ownership, finally ending up as part of Lord Weinstock’s GEC empire. His Lordship wanted to close Airdun (as the company was known by then), and Dad fought for a considerable time through a difficult economic climate to keep the company operational and the men in work. However, when Dad reached retirement, Lord Weinstock had his way, and the factory is now the site of a Tesco supermarket. Retirement brought a permanent move to Campbeltown – and a new career. Over his last few years at Airdun, Dad had returned to painting, at first in watercolour, but more and more in oils and acrylics, quickly establishing himself as a popular portrayer of Kintyre (and Argyll) in all its aspects. This new career lasted nearly as long as his earlier management one had, and it was a particular pleasure for me getting to know my father as a friend and fellow artist as well as ‘my Dad’. In 1989 when my wife Gill and I established The Oystercatcher Gallery in Campbeltown, Dad’s work quickly became a mainstay of our artistic output. And before his failing health made such things to difficult to attempt, he was a regular and dutiful visitor to see ‘what’s new’. At this time Dad also remarried – to Margaret Millar (originally from Kilkivan, near Machrihanish). In latter years, he took on the role of carer for Margaret, even although he was somewhat less than spritely himself at times. They remained together for some 30 years at Witchburn Terrace, although Dad still managed to find time to tend his last garden creation – at Dalbuie, the family home near Southend. 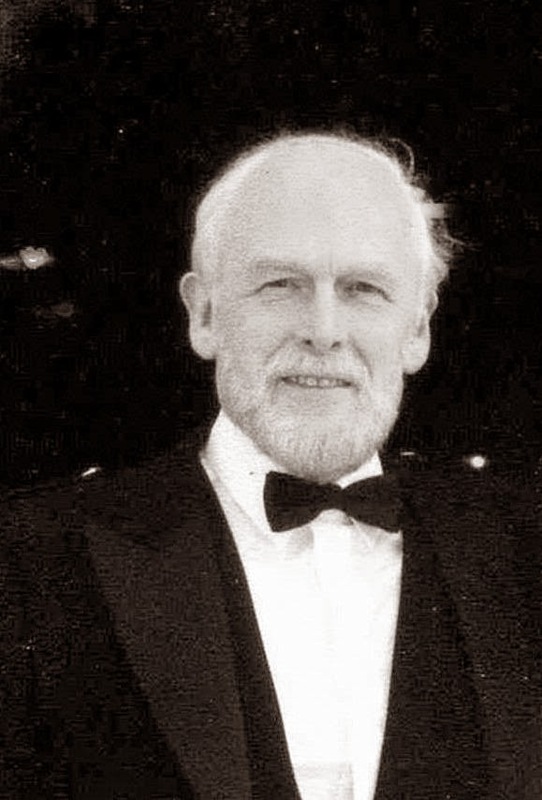 He enjoyed his involvement with the many organisations he joined over the years – The Kintyre Antiquarians, The Society of Antiquaries of Scotland, The Trades House of Glasgow among them. To the end of his life, though born in Bothwell in industrial North Lanarkshire, Dad maintained a love of Kintyre and never ceased to want to describe that love in paint. 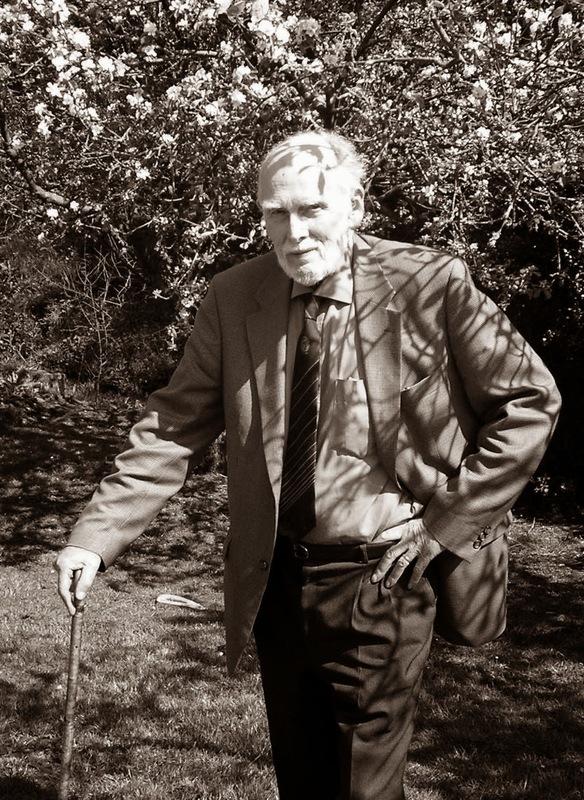 The cruelty of his last year was that – for a man who had spent his life interested in the natural world in all its’ great diversity – he was confined to the house, and not very mobile even there. It was only a few weeks before his death that he came to realise that he might not manage to lift a brush again – though he never stopped planning new pictures, and I would often be sent to the studio to get brushes or paint. He knew he did not have long to go, and faced that prospect with dignity. I realised that in this brief chronology of a life, I have omitted so much about the man who was such an inspiration to me – his quirky sense of humour, his patience and gentleness, his helpfulness and sound advice, his constantly inquisitive outlook on life that kept his mind sharp to the end. And so much more. I only recall a single occasion when he lost his temper with me [and even then reluctantly], when, aged about 7, I painted all of his tools and much of the inside of our garage in sky-blue gloss paint. It must have been a severe provocation on my part. But I also know how much that exercise in discipline cost him. He was always a gentle man – and a gentleman. There was a brief time in our relationship where I saw little of him. I was a young man trying to make my way in the world – with some success, and a good deal of failure [some of it conspicuous], but I was never condemned or berated – whatever Dad must have felt about it. He took being a father seriously, and of all his many talents, it is perhaps the one at which he excelled the most. Alongside me, my sister Ann and my brother Rory can testify to that. Hi, Have enjoyed family holidays in Carradale, Kintyre for over 14 years and recently whilst staying at the Carradale Hotel, noticed the colourful painting of the harbour in the lounge area by MacKean Stewart dated 93. It was lovely and I just wanted to say how much I appreciated it whilst enjoying my evening meal.